Directions: In downtown Morehead on the backside of the Whitaker Bank Building, high above the drive through windows. 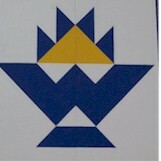 Notes: Quilt block is a pattern on which the bank’s official logo is based. The bank donated for use on the quilt block two special ordered cans of paint which are the exact colors used by the bank’s headquarters for their logo design.